Top 10 Gluten Free Food List For Everyday Life! Starting a gluten free diet may seem like a daunting task. Gone are the days of sweet cakes and sandwich bread, and pasta becomes only a figment of your imagination. A gluten free diet for kids can be even more challenging because of the elimination of kid friendly foods like sandwiches and pizza. 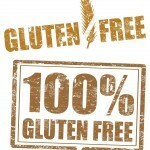 However, a gluten free diet menu doesn’t have to be tasteless, boring and no fun. We’ve come up with a practical gluten free food list that is sure to contain foods that you and your family can really incorporate into smart and delicious meals. So before you head to the grocery store, check out this Top 10 gluten free food list! 1. Rice: Rice is an incredibly versatile food. Capable as serving as a delectable vehicle for all sorts of vegetables, or, fantastic as a standalone meal, rice is one dish that isn’t hard at all to incorporate into a gluten sensitivity diet, or into one designed for people with celiac disease. 2. Potatoes: You can do just about anything with potatoes. Mash them, bake them or cut them into fries. It doesn’t matter what you do to a potato, it’s just downright hard to make them taste bad. Enjoy them and add them to your gluten free food list! 3. Rice Cakes: A staple of weight loss diets since their inception, rice cakes have come a long way since their early days existing as tasteless, crunchy discs. Flavors like cinnamon and chocolate and even cheese and butter can really spice up this healthy snack. 4. Chicken: No gluten free food list would be complete without chicken. Grilled and baked chicken serves as not only a lean and healthful entrée, but it’s also devoid of gluten. Mind the breading though, because it’s likely both gluten and grease laden. 5. Fish: Chock full of omegas and other essential nutrients, you didn’t need another excuse to incorporate fish into your diet. But, it’s also free of gluten, and that’s just another bonus to this ocean dwelling main course. 6. Beef: For the non seafood crowd and those that are tired of poultry, have no fear for another meat is perched right in the middle of our gluten free food list. Beef, with its enormous flexibility to create a wide range of dishes and meals, is a tasty and easy to create great meals with. 7. Marshmallows: Yup. Nobody needs an explanation here. Marshmallows are on the list, so enjoy eating them. For people sensitive to gluten, sweets and desserts of many kinds are often off limits, so incorporating a portable and childlike sweet onto our gluten free food list was an absolute must! 8. Milk: It’s not a food, but it’s used in a whole lot of them. Most dairy products in general are appropriate as part of a gluten sensitivity diet. 9. Tomatoes: All vegetables are gluten free, but tomatoes are one in particular that can really transform dishes, soups and stews. Because of that, they have earned a place on our gluten free food list. 10. Broccoli: Whether you have wheat allergy symptoms or are battling gluten intolerance, you can’t go wrong with broccoli. Filling, fiber filled and loaded with vitamins and minerals, broccoli is a definite top pick for almost any sort of diet plan. Be aware of processed foods, even if they are dairy because they may contain additives and other ingredients that contain gluten. The same is true for canned fruits and vegetables. Regardless of what foods you have to give up adhering to a gluten free lifestyle, there are many tasty and healthful options that you can include and make the most of. Consider combining ingredients like rice, vegetables and meats for tasty stir fry. And, fruits can serve as their own dessert items when they are fresh and in season and their sweetness at its peak.